Volatility in international capital flows can disrupt international trade and finance. This column explores the role of agents’ exposure to risk in this dynamic, focusing on domestic financial firms. It finds that the impact of an increase in risk aversion on foreign currency funding is conditional on the bank’s initial net currency exposure. This suggests that the empirical link from global factors to cross-border bank funding depends on country-specific characteristics of financial institutions. While international capital flows have many merits, policymakers have long been concerned that their volatility can lead to trade and financial disruption. A large and active research agenda has focused on understanding the drivers of flows. A key finding is the central role of global financial conditions. Forbes and Warnock (2012), Fratzscher (2012), Ghosh et al. (2014), and Rey (2015), among others, have shown that financial conditions in core economies and risk perceptions are significant drivers of large swings in capital flows.However, the role of global conditions is not that firmly established, with Cerutti et al. (2017) offering a sceptical view. In addition, the impactof global factors can be sensitive to the specific type of investments and the sample considered. Avdjiev et al. (2017) find that the impact of US interest rates and the VIX index has substantially changed through the crisis, affecting lending through bonds or banks differently. In addition, capital flows react to global financial conditions in a qualitatively different way across countries and over time (Goldberg and Krogstrup 2018). In a recent paper, we stress the role of agents’ exposure to risk, focusing on domestic financial firms (Krogstrup and Tille 2018). If capital flows are partly driven by the adjustment of domestic financial firms’ foreign exposure when global risk conditions change, then the impact of global conditions on capital flows will depend on the nature of the initial exposure that domestic institutions seek to adjust. Specifically, if they have a short exposure in foreign currency – borrowing in foreign currency to fund domestic currency lending – reducing the foreign exposure requires a reduction in foreign currency borrowing from the rest of the world (i.e. an outflow of foreign capital). By contrast, if financial institutions have a long exposure, shedding foreign risk requires increasing foreign currency borrowing (or selling foreign assets), which amounts to a capital inflow. We make this point more formally with a portfolio model of a bank that borrows and lends in different currencies. 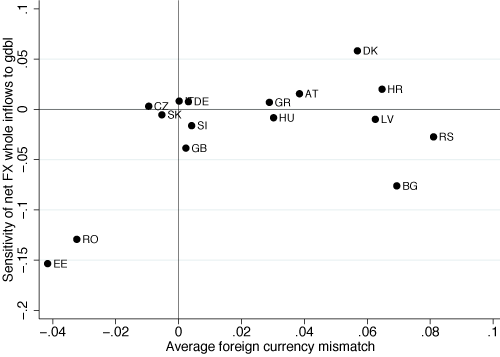 Currency exposure is a substantial risk factor for banks and other financial institutions, as documented notably in Avdjiev and Takats (2016), Brunnermeier et al. (2009), Bruno and Shin (2015b), Caballero et al. (2015), Dell'Ariccia et al. (2016), Krogstrup and Tille (2017). Our focus on banks is motivated by the fact that the link between bank flows and global factors has received special attention from researchers. Bank flows make up a large share of total capital flows, are volatile and constitute one of the main channels of the international transmission of shocks (Milesi-Ferretti and Tille 2011, Avdjiev et al. 2012, Bussiere et al. 2016, McCauley et al. 2015, McQuade and Shcmitz 2016). But the mechanisms can also apply to any other type of financial institution. Our model of bank portfolio choice allows us to assess the impact of global financial factors on banks’ choice of funding and lending activity across currencies. Global financial factors are modelled as tolerance to risk (e.g. risk aversion). The bank holds loans and deposits in domestic and foreign currencies that it cannot rapidly adjust. Thus, when risk conditions change, the bank adjusts its exposure through its wholesale foreign currency funding (or lending) activity. We find support for the predictions of the model relying on currency exposure data of banking sectors in a set of European countries. We have used a new dataset from the Swiss National Bank. The data include the balance sheets of 16 banking sectors (aggregated at the country level) of advanced and emerging European countries at a quarterly frequency since 2009. Assets and liabilities are broken down by several balance sheet categories, and each position is in turn divided by positions denominated in local currency and positions denominated in foreign currencies.2 The currency split allows us to compute the aggregate on-balance sheet foreign currency exposure of banking sectors,3 as well as the corresponding flows by taking changes in positions adjusted for the valuation effects of exchange rate movements. The data illustrate substantial heterogeneity in banking sectors’ foreign currency exposures (Figure 1) and in the volatility of funding flows (Figure 2), both across countries and time. Notes: For each country the dot depicts the mean foreign currency exposure (in percentage of total assets),and the bar shows the 1/- one standard deviation range. Notes: For each country, the dot shows the average of the foreign currency funding flow (in percentage of the funding position), and the bar shows the 1/- one standard deviation range. In a first cut of the data, we regress foreign currency funding flows on a global risk factor for each country individually. The global risk factor is proxied by US broker dealer leverage, which measures risk appetite in global banking as in Adrian and Shin (2014). We consider the opposite of leverage so that an increase in our global factor reflects tighter global financial conditions (in line with the VIX). We expect foreign currency funding to be negatively related to the global factor in countries with banking sectors that a short net exposure in foreign currency, and positive in countries where banks have a net long exposure. 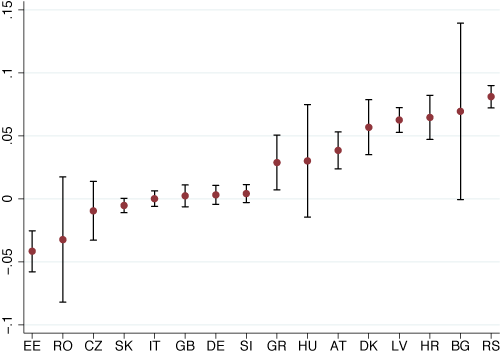 Figure 3 plots the estimated country-specific regression coefficients against the average country-specific foreign currency exposure, and confirms a positive slope. Notes: Thevertical axis is the OLS regression coefficient of foreign currency funding flows (percentage of assets) on risk perception ((-1) times changes in broker dealer leverage). The horizontal axis is the average foreign currency exposure. 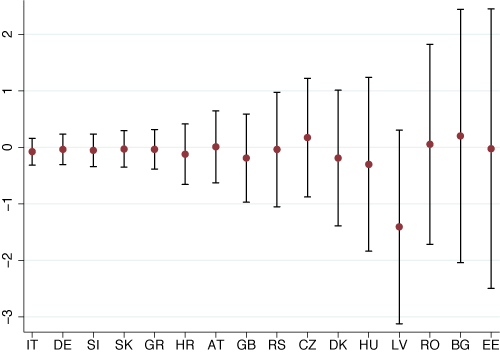 We also undertake a more rigorous econometric assessment based on both cross-country and time-series variation, using panel regression techniques. We regress foreign currency funding flows on the global risk factor, changes in exchange and interest rates, loans, and deposits in foreign currencies. A key point to consider is an interaction term between the global factor and the average net currency exposure, as this captures the role of exposure in determining the impact of global factors on foreign currency funding. We find that the global risk factor is not significant on its own, but is significant when interacted with the country’s net foreign exchange exposure, in line with our theoretical prediction. This is particularly the case in the subsample of emerging European economies. Interestingly, the results only hold when the global factor is measured by US broker dealer leverage. Using the VIX or other global financial proxies from the literature leads to insignificant interaction terms. While the VIX has been quite popular as an empirical proxy for global risk sentiment, it captures conditions in the stock market that could be a poor proxy for risk tolerance in other segments of the financial markets, such as banking. The role of global drivers of the financial cycle has received a lot of attention in recent years. Our analysis suggests that the empirical link from global factors to cross-border bank funding, and possibly, to capital flows more broadly, depends on country specific characteristics of financial institutions. We have stressed the role of foreign currency exposure of domestic financial institutions. This exposure can be long as well as short, with very different implications for funding flows in times of risk reduction. The foreign currency exposures of domestic institutions are hence not just indicators of a country’s vulnerability to capital flow volatility, but may constitute drivers of this volatility in their own right. Authors’ note: The views expressed here are those of the authors and should not be attributed to the institutions with which they are affiliated. Adrian, T and H Song Shin (2014), “Procyclical leverage and value-at-risk,” Review of Financial Studies 27(2): 373–403. Avdjiev, S, L Gambacorta, L Goldberg and S Schiaffi (2017), “The shifting drivers of international capital flows,” Federal Reserve Bank of New York, Staff Report 819. Avdjiev, S and E Takats (2016), “Monetary policy spillovers and currency networks in crossborder bank lending,” BIS Working Paper 549. Avdjiev, S, Z Kuti and E Takats (2012), “The euro area crisis and cross-border lending to emerging markets,” Bank for International Settlements Quarterly Review: 37–47. Brunnermeier, M, S Nagel, and L H Pedersen (2009), “Carry trades and currency crashes,” NBER Macroeconomics Annual: 313–347. Bruno, V and H Song Shin (2015a), “Capital flows and the risk-taking channel of monetary policy,” Journal of Monetary Economics 71(C): 119–132. Bruno, V and H Song Shin (2015b), “Global dollar credit and carry trades: A firm-level analysis,” BIS Working Paper 510. Bussière, M, J Schmidt and N Valla (2016), “International financial flows in the new normal: Key patterns (and why we should care),” CEPII Policy Brief 2016-10. Caballero, J, U Panizza and A Powell (2015), “The second wave of global liquidity: Why are firms acting like financial intermediaries?” CEPR Discussion Paper 10926. Cerutti, E, S Claessens and A K Rose (2017), “How important is the global financial cycle? Evidence from capital flows,” CEPR Discussion Paper 12075. Dell'Ariccia, G, L Laeven and R Maquez (2016), “Financial frictions, foreign currency borrowing, and systemic risk”, IMF, Manuscript. Forbes, K and F Warnock (2012), “Capital ow waves: Surges, stops, flight, and retrenchment,” Journal of International Economics 88: 235–251. Fratzscher, M (2012), “Capital flows, push versus pull factors and the global financial crisis,” Journal of International Economics 88: 341–356. Ghosh, A, M Qureshi, J Il Kim and J Zalduendo (2014), “Surges,” Journal of International Economics 92: 266–285. Goldberg, L and S Krogstrup (2018), “International capital flow pressures,” IMF Working Paper 18/30. Krogstrup, S and C Tille (2018), “Foreign currency bank funding and global factors,” IMF Working Paper 18/97. Krogstrup, S and C Tille (2017), “On the roles of different foreign currencies in European bank lending,” in International Currency Exposure, CESifo Seminar Series, MIT Press. Milesi-Ferretti, G M and C Tille (2011), “The great retrenchment: International capital flows during the global financial crisis,” Economic Policy 26(66): 285–342. McCauley, R, P McGuire and V Sushko (2015), “Global dollar credit: Links to US monetary policy and leverage,” BIS, Working Paper 483. McQuade, P and M Schmitz (2016), “The great moderation in international capital flows: a global phenomenon?” European Central Bank, Working Paper 1952. Rey, H (2015), “Dilemma not trilemma: The global financial cycle and monetary policy independence,” NBER, Working Paper 21162. Notably, the valuation effects and impact on expected profits of movements in exchange rates matter qualitatively for foreign funding demand. These channels are similar to the risk-taking channel described in Bruno and Shin (2015a). These are further split between Swiss francs and other foreign currencies. We discuss the role of off-balance sheet hedging in more detail in Krogstrup and Tille (2018).